In the book Alexander and the Terrible, Horrible, No Good, Very Bad Day, the title character is having a bad day. Everything goes wrong. He gets carsick on the way to school. His teacher likes another kid’s picture better than his. She says he sings too loud. The elevator door at the dentist’s office closes on his foot. Last week’s sermon was titled: Abraham and the Terrible, Horrible, No Good, Very Bad Day, Part One. Unlike last week’s reading from Genesis, which I chose to preach on, ignoring almost entirely a challenging gospel text, these week’s Old Testament reading is one we cannot choose to preach on or not. The story of Abraham and Isaac demands our attention. But what if there is something we should learn from this passage? We won’t learn anything if we just decide it’s awful and we hate it. The questions that abound when we hear about “The Binding of Isaac” are the hardest ones to answer: What kind of God would do such a thing? Why would God put Abraham to the test? How could Abraham obey? Do I really want a God like this? Perhaps this is a story that simply teaches us that God makes no sense. But it does make sense if we remember that faith—especially the faith of Abraham, early in the life of God’s relationship to God’s people—is a risky business. There are several things to reflect on in this story of Abraham and Isaac, which is really a story of Abraham and God. One could say that God is trying a new strategy, focusing on one relationship with one man and his descendants, creating a great nation, a covenant community to receive the blessing that God is all about. So this is a story about the solidifying of that blessing-giving relationship. Like I said, faith is a risky business. And it is a give-and-take business. Yes, God is always there. But our experience of God is determined by how we receive that presence. So the first thing I want to is that this story must be read in the context of God’s whole relationship with humanity that has contributed to his relationship to Abraham. The second thing I want to say is that it is a story not about obedience, but about trust. If it is a story about obedience alone, then it is a scary story about abuse of power. If it is about trust, then it is a story about a relationship that will last to eternity. Abraham and God’s relationship got off to a rocky start. Abraham didn’t always trust God the way he does in today’s story. But by the time we get to today, Abraham never wavers. He does everything God tells him to do. If you remember my sermon from last week, you remember the code phrase which is a clue to Abraham’s unswerving faith. Anyone remember? Abraham rose early in the morning…. Abraham trusts God. His response is not blind obedience, but active faith. And faith is a risky business. Think about other kinds of covenanted relationships. Baptism is one. We make a covenant with God and with a community, and we promise to act as Jesus in the world. When asked if we will do these things, we say I will, with God’s help. We will. Not we will try, not we will think about whether it makes sense, but we will act. Marriage is another kind of covenanted relationship. Marriage is not about proving yourself to the other person, but about being together through thick and thin, even when one’s beloved does hurtful, incomprehensible things. Loving relationships—between spouses, parents and children, good friends—are not based upon what we think about the other person, but about the trust we have for one another. Abraham and God have this kind of trust. It is as if—and again, I credit Ellen Davis for this thought—God and Abraham have a long and complicated marriage. Isaac, the miracle child, is their offspring, the bearer of Abraham’s genes and God’s promise. Therefore, Abraham can forgive God, Isaac can forgive Abraham, and the descendants of Abraham and Isaac will be as numerous as the stars of heaven and as the sand that is on the seashore. There is no tidy way to end a sermon on this reading. Or if there is, I don’t know what it is. I want to leave you instead with an image. Or several images. If you search google for images of this passage, through the ages, almost all of them share several common features. Abraham has the knife in his hand, and Isaac is looking up at him with curiosity, almost as a detached observer. Perhaps because Isaac has deep faith in Abraham. In some of the paintings, we see the ram in the thicket. But Abraham is always looking up, as if he, like the plsamist in Psalm 121, knows from whence his help is to come. He may not know for sure what is going to happen, but he is relying upon God to show him. I hope that God will never set before us the task given to Abraham. But I pray that we might all have Abraham’s faith. In our church calendar, this Sunday marks our return to what is often called “Ordinary Time.” I don’t think there’s anything ordinary about gathering to read scripture, sing praises, and share bread and wine in the name of Jesus, so I prefer to call this season by its proper name: The Season After Pentecost. Also know, at least in my mind, as The Long Green Season. When we move into this Long Green Season, our schedule of readings shifts. We no longer hear readings that point toward themes of Advent or Christmas—the Incarnation cycle—or Lent and Easter—the Paschal cycle—but return to the Sunday lectionary for this season after Pentecost. If you follow the Sunday lectionary, or if you are a reader and have ever tried to find your reading for the day, you know that in this long, green season you have some choices for the Old Testament readings, Track One or Track Two. This drives the altar guild nuts and I don’t blame them! Does anyone know the difference between Track 1 and Track 2? This year, and for the next three years, we’ll be on Track 1. So on this Sunday, we enter into the Book of Genesis, already in progress. We’ll be in Genesis through the middle of August. In Track 1, the Old Testament readings tend to be longer, and we get to hear stories we wouldn’t otherwise hear on a Sunday (and didn’t hear, until the adoption of the Revised Common Lectionary by the Episcopal Church in 2006). 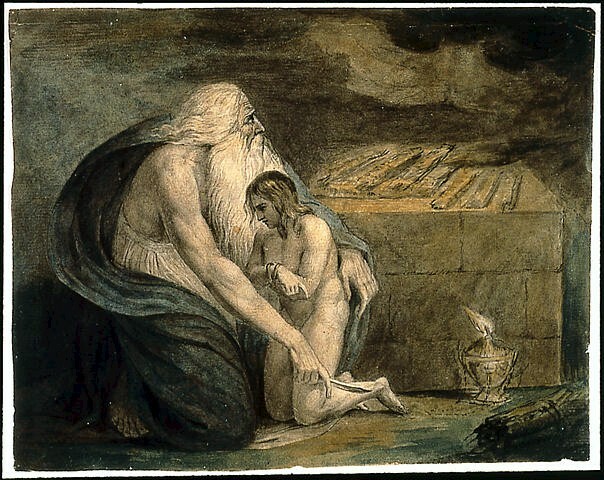 I’m titling this sermon: Abraham and the Terrible, Horrible, No Good, Very Bad Day, Part One. Anyone remember that children’s book, Alexander and the Terrible, Horrible, No Good, Very Bad Day? It was written in 1972 by Judith Viorst, who is also a novelist and a psychotherapist. It was a classic in our house and is one of my very favorite children’s books. Everything is going wrong for Alexander. He falls asleep with gum in his mouth and wakes up with gum in his hair. His brothers get the prizes in the cereal boxes. His mother forgets to pack dessert in his lunch. He went to the dentist and had multiple cavities. And on and on. Abraham’s problems are far more significant than Alexander’s. His wife, Sarah, in spite of the miracle of bearing a son, Isaac, in her old age, is jealous of the servant girl Hagar. Hagar had earlier borne a son to Abraham, in case no other offspring would be forthcoming. Hagar’s son, Ishmael, is several years older than Isaac, but the two boys play together. This is a constant reminder to Sarah of her old age, painful years of infertility, and her desire for Isaac to be the sole heir of Abraham’s fortunes, which are considerable. Sarah wants Hagar and her boy to be cast out, and the scripture tells us that this is distressing to Abraham on account of his son. Can you imagine? Those of you with experience with blended families—or family of any kind, really—know how distressing it can be to be the one responsible for holding it all together. God reassures Abraham that he doesn’t have to be the one to hold it all together. In God’s scheme of things, it is all together, even as Hagar and her son are sent away. God will continue to care for them. The scripture goes on to tell us that Abraham “rose early in the morning.” This is a code phrase in the Hebrew Bible. Usually when someone rises early in the morning, it is an act of faithful obedience. This is a poignant scene, heart-breaking and difficult to imagine. 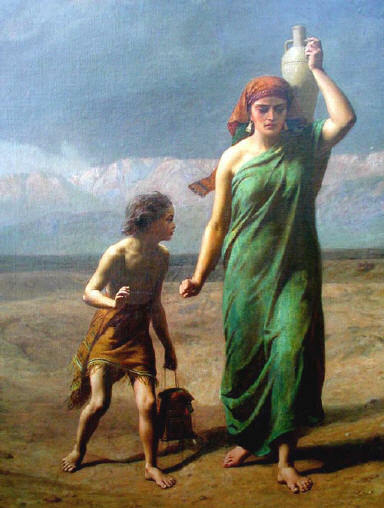 Abraham gives Hagar food and water for a few days’ journey and sends her away to wander about in the wilderness. What are we to make of this story? God saves Hagar—God hears her cries of despair and the suffering of her son. Like the psalms, Hagar cries out to God, God hears her and Ishmael, like Isaac, becomes the father of a great nation. The story reminds us that God is not only with God’s chosen people, but with exiles in the wilderness. Who are the Hagars in the world around us? How will we respond? All sorts of rejected women find their stories in [Hagar]. She is the faithful maid exploited, the black woman used by the male and abused by the female of the ruling class, the surrogate mother, the resident alien without legal recourse, the other woman, the runaway youth, the shopping bag lady carrying bread and water, the homeless woman, the indigent relying upon handouts from the power structure, the welfare mother, and the self-effacing female whose own identity shrinks in service to others. This story has obvious implications to our lives as Christians; it is one of the foundational stories that would have influenced Jesus’ teachings about God’s love for the foreigner and the outcast. And—even though there are no intentional thematic connections between the Old Testament readings and the gospel—this story has lessons for us about how we follow Jesus and whom we consider family. The hard sayings about family in today’s gospel, about families divided, challenges our notions of family, and loyalty, just as Abraham is challenged. We are to look outward, beyond our family and beyond our familiars, to find Hagar and Ishmael in the wilderness and to celebrate God’s saving action in their lives, as in ours. O Lord, you have made us but a little lower than the angels. Like so many scripture stories about Jesus, the scene from today’s reading from the Book of Acts unfolds with a dream-like quality as the writer replays for us the Ascension moment. Jesus has been with his followers for forty days, give or take, after the resurrection, appearing to small groups of disciples in equally dream-like scenes. Now Jesus is again with his gathered disciples, and they want to know: Is this the time when you will restore the kingdom to Israel?” “Not exactly,” Jesus answers, and then says: But you will receive power when the Holy Spirit has come upon you, and you will be my witnesses to the ends of the earth. In other words, with the mysterious arrival of this thing Jesus calls the Holy Spirit, it will be up to them, the disciples, to restore the Kingdom and to be Jesus’ witnesses to the ends of the earth. 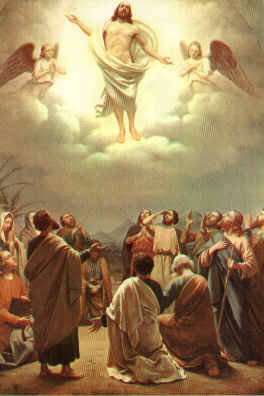 Without further ado, Jesus levitates, head first, into the sky. If you do any kind of search of images for “Ascension” you’ll see hundreds of paintings of Jesus up in the air and a bunch of people looking up at him with utter bewilderment as he disappears into the clouds. What does this remind you of? Easter morning, right? Then we encountered several different men robed in dazzling white and asking: Mary, why are you weeping? He is not here. What are you looking for? What’s different, this time around? The disciples understand a little more than they did. They have sorted out a little more about what resurrection means. But this ascending thing….they are astonished and bewildered. Let’s imagine ourselves with the disciples on the ground, looking up. Jesus has left us. We’re home alone. Eventually we stop looking up and look at one another instead. This is the question I always ask at funerals. When we have lost someone we love, or heard about the tragic death of someone we didn’t even know, it is natural to ask: Why did this happen? How could God let this happen? But the real question that will help us in our grief, in our bewilderment, is what do we do now? How do we live our lives in the absence of this person? What we do now is we live our lives honoring—by imitating—the qualities in the absent one that made him or her unique. So what do we honor in Jesus? How do we change the way we live our lives in order to go about the business of honoring what made Jesus special? Ascension reminds us—as if we ever had any doubt—that Jesus is not like us. Or rather, he is and he isn’t. Fully human and, as the old version of the creed says: very God of very God. As we follow the Jesus story from Advent to this moment and beyond, we are continually invited into Jesus’ humanity and into his divinity. O Lord, you have made us a little lower than the angels. How do we honor Jesus, in Jesus’ absence? Jesus held the world lightly. He proclaimed God’s love to outcasts and sinners by including them, healing them. He took every opportunity he could do eat and drink with his disciples, friends, strangers, and enemies. He never stopped talking about his purpose on earth, to bring healing and reconciliation. When we do these things in Jesus’ name, on his behalf, we are restoring the Kingdom of Israel, not the way the disciples think, not in the political realm but in the human-becoming-divine realm. How does that happen around here? Lots of ways. We can to point to the Village Support Network, a wonderful effort of New City Initiative, for which we have a new team beginning training this afternoon. Or Rahab’s Sisters, which has a St. David’s team providing hospitality to marginalized women on 82nd Avenue whenever there’s a fifth Friday. Or to the many life-changing things that happen in this building around music, and the development of small children. Or to the behind-the-scenes support for worship, like altar guild and making coffee. All of these things are essential pieces of what it means to follow Jesus. Especially making coffee. But proclaiming the good news and being Christ’s witnesses does not only happen in church. If we think that’s the only place it happens, we will always be disappointed. Being Christ’s witnesses to the end of the earth and restoring the Kingdom God intends for us is not only about church ministries or volunteering. It is about how we live our lives. How we interact with our families, with people we work with, and with people we don’t even know. Next Sunday is a baptismal day when we renew our own baptismal covenant. The baptismal promises are about how we live every day of our lives. That is what we are called to do when we are “home alone” in this world God loves, the world God sent Jesus to inhabit with us. Being Jesus’ witnesses to the end of the earth is not about inviting people to church. Often when we talk about evangelism, we make that mistake. We tell people about the great fellowship at our church, the fabulous coffee, the wonderful music. It’s all true. But how often do we talk about how our lives have been changed by God? Yes, I’m talking about testimony. We all have one, although as Episcopalians sometimes I think we’d rather die than share it. But according to Jesus, share it we must. I was a troubled adolescent and young adult, with a lot of problems, particularly with addiction to almost anything, but mostly alcohol. God’s grace intervened; looking back, it was as if I was plucked from the jaws of death, but it was probably far less dramatic and more mysterious. When I stumbled into a church for the first time at the age of 24, it was easy for me to believe in the resurrection of Jesus and what that meant for us. I loved how the death-and-resurrection story was retold every Sunday in the Eucharist. God saved my life and Jesus taught me how to live in the world. If God can do that for someone as broken and screwed up as me, God can do that for anyone. O Lord, you have made us a little lower than the angels. Strengthen your people, Holy One, that in your Son Jesus we might celebrate our humanity and our divinity, and spread the Good News of your Kingdom to the ends of the earth.